This marks the third year the CSU is partnering with the Association of Independent California Colleges and Universities (AICCU) and the New Teacher Center (NTC) to host the summit and bring together a growing network of educators to share strategies and lessons learned in the classroom. The CSU is the largest producer of teachers in both the state and nation. As teachers prepare for the upcoming school year, this summit provides a unique opportunity to give them a forum to share cutting edge strategies and best practices led by teachers and for teachers. Teachers will gain concrete knowledge and have the opportunity to network with colleagues from their home region supporting continued collaboration. Dr. Jill Biden, a lifelong educator and former Second Lady of the United States will provide the keynote address, which will be livestreamed from the event headquarters to all 35 sites. The day-long summit will also include TED-style EdTalks presented by local teachers, as well as Edcamp discussions on timely topics like bullying in the classroom, celebrating diversity and teaching students to be critical thinkers. At Sonoma State, there will be a focus on the Maker movement with attendees able to explore the university's brand new Makerspace in the library. Alternative education teacher and Sonoma State alum Jonna Weidaw will give an EdTalk titled "Together We Succeed: How Design Thinking Can Change Lives." She has been employed at the Mendocino County Office of Education in the Alternative Education Department since 2003 and is the recipient of a Digital Excellence Award from the state for technology integration and instruction. Weidaw believes in the importance of teaching active citizenship and justice by engaging students in real world action projects, which are designed to engage students in their local communities and fit their diverse learning needs. She also works for Dominican University providing seminars for student teachers in classroom management techniques, 21st century skills and coding. There will also be an afternoon workshop with Ken Simon, director of programs at World Saavy, and members of the California International Studies Project to learn how to help students think globally and act locally using the principles of design thinking and project based learning. All California teachers, teacher candidates and school administrators are invited to participate in this summit. Events will be held throughout the state and registration is free. 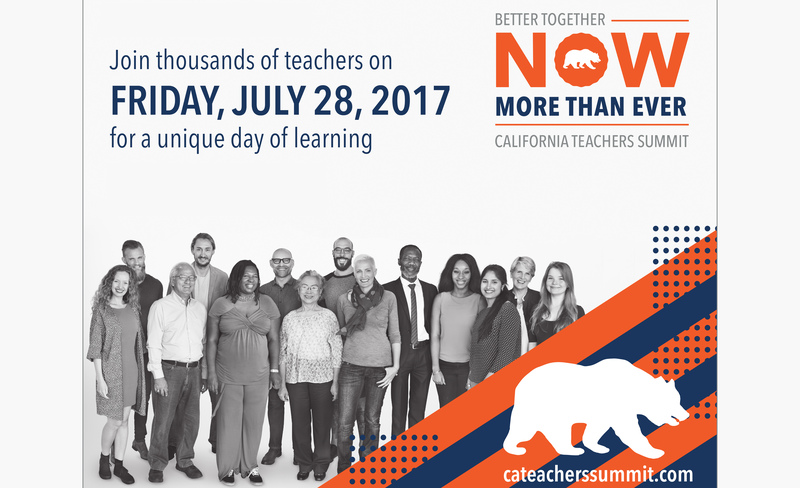 For more information or to register online, visit www.cateacherssummit.com/register, and follow #BetterTogetherCA for up-to-date information. The California State University is the largest system of senior higher education in the country, with 23 campuses, 50,800 faculty and staff and 479,000 students. Half of the CSU's students transfer from California Community Colleges. Created in 1960, the mission of the CSU is to provide high-quality, affordable education to meet the ever changing needs of California. With its commitment to quality, opportunity, and student success, the CSU is renowned for superb teaching, innovative research and for producing job-ready graduates. Each year, the CSU awards more than 110,000 degrees. One in every 20 Americans holding a college degree is a graduate of the CSU and our alumni are 3.4 million strong.